Basic question: When is this mod needed? Anytime you use a walbro or only if you run larger pumps / double pumps? I've heard with the output of the walbro400, running stock wiring poses a potential fire hazard. As for me, if i can squeeze more flow out the pump for more flow to get more power, i want it... it beats paying $500+ for bigger injectors . i'm being tuned right now by Mr. Ron Watson so i want to get it right asap. Last edited by punchjamesarnol; 12-25-2012 at 09:09 PM. How much more flow do you get? At what point do you realize this needs to be done? Yeah I know it's an easy mod so why not just do it, but you're introducing another failure point (relay) into the system. And I've had relays fail. So I'm trying to figure out at what point is it worth doing this mod. Is it going to turn your 550cc injectors into 600cc? I'm trying to get more out of my 1200's because my idc's maxed. plus i don't want to risk frying the stock wiring. What are your suggestions Bad Noodle? I'm not sure. It sounds like you have a serious turbo on there. I was just wondering if this is something worth doing in a dd. How many amps does the pump draw? What is the correct wire size for the power requirement? What is the stock size? If you're needing a bit more, it works. It worked really well for me. If you're worried about it failing, just carry a spare relay and swap it out if it does crap out. I have my fuel pump ground going to the FPC and the ground off the relay going to the chassis. So this is better than taking the ground off the FPC and running it straight to the chassis? I'm worried that ill fry the FPC if I leave it the way it is since the higher amps are coming off the battery and ending up in the FPC. Right now it seems to be running fine though. It seem's like you can do it this way with 3 different options. (1.) Do this but don't chassis ground the pump leave the OEM ground going threw the OEM harness. (2.) You could run a whole new ground wire directly off the controller harness to the pump. To keep the current up as high as possible while still maintaining the fuel pump controller. That would eliminate the current drop (if any) caused by the harness on top the sending unit. (3.) Instead of chassis ground on relay. It could be ran to FPC ground that originally went to the pump. This way the pump can have equal gauge wire on + and - side helping with current. Witch one of these options would be best? I'm thinking Option (3.) though I'd prefer option (1.) being how lazy I can get! I'm also thinking option (3.) would burn up the relay I'm not 100% but would the relay need that constant ground to operate correctly? I think this Diagram would work best or have the ground from the relay go back to the FPC. This would mean the FPC is only supplying power to switch the direct connection on and off. Last edited by jockeygolfs; 02-14-2013 at 07:47 AM. This is what was done in the first post. Leaving the small OEM wires going to the pump doesn't make much sense, because it's still there as a restriction. The newer post has the upgraded wiring run directly to the pump itself, I assume with a spade connector directly onto the pump. I confirmed with an electrical engineer. The smaller gauge wire is fine so long as the length does not exceed its capability to carry the required amps. The stock wiring from the pump to the hat and just above the hat could be as short as 1 foot which an 18 ga wire can carry 24 amps up to 5'. This is based on a table I found online. Last edited by jockeygolfs; 02-14-2013 at 12:02 PM. Total circuit length is to the alternator and back and resistance in the loop is going to be affected by the wires to the pump itself. Enough? That's hard to say. It's not like there's some magical length at which a certain current becomes a major restriction for a given wire size. It's all about combined resistance, voltage and current in the circuit. I didn't find it that hard to re-run the wires to the pump. be careful with using audio wires. These are often labeled as 10 "gauge" and 12 "gauge" wires instead of 10 AWG or 12 AWG. 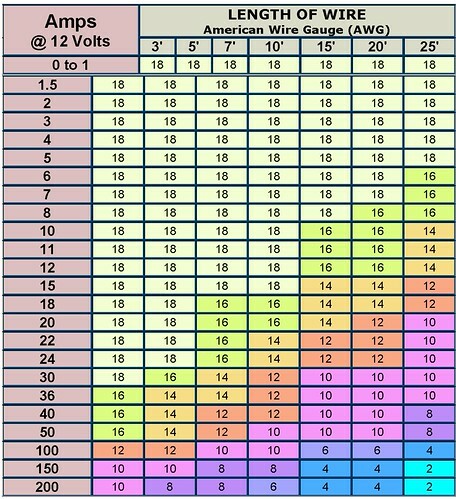 Assume any "gauge" wire is about 1.5 AWG smaller than what it says it is. It will have thicker insulation to make the overall thickness comparable to the AWG wire it says it is in "gauge". Also make sure they're copper. Some are using copper clad aluminum to make them thicker, and even call them AWG as a result, but the resistance isn't comparable to copper wires of the same AWG. Last edited by Concillian; 02-15-2013 at 01:57 AM. 1000-1200 cc injectors or raising fuel pressure on the ~950cc EV14 injectors on the in-tank upgraded pumps like Walbro, DW300, Aero 3xx. Definitely if you're doing anything with the larger Walbro 4xx pumps. You can turn 550cc injectors into 600cc injectors if you have extra pump capacity by raising base fuel pressure. Back in the day, when pinks were all there were, this was done by crushing the FPR. Now that larger injectors are more readily available, there's little need to do so. And cutting the tops has since been discovered as well. Since I know you're very familiar with MAFv scaling, you can tell you need it if your OL MAFv scaling deviates significantly from a power function only at high flows. At that point, your injectors are needing to stay open longer than modeled for a given airflow, meaning fuel pressure is dropping from the expected value. Last edited by Concillian; 02-15-2013 at 02:12 AM. I believe the total circuit length for the pump is from the battery to the pump and from the pump to ground. The alternator is not used to power the pump since it is directly wired from the battery. The length of the line from the FPC to the relay and back to the FPC is inconsequential since it only powers the relay switch which takes very little to power. The only issue I have is I have an 11' STI and the plastic fuel can. I was thinking of getting the grommets and feed the larger wires through the hat to have a consistent wire size all the way but I'd rather not if it isn't necessary. Nice warning on the wire gauges. I'll have to double check my wires. Ok so I wired my pump this morning like the schematic I posted a few posts ago. The pump turns on and off with the key. What I did notice was that before the humming sound of the pump would die off a few seconds after priming. Now I can hear a faint humming sound that does not stop. Does this mean my pump is now 100% on all the time when I start my car? I also noticed that my Defi gauge that I have to read fuel pressure is up at 70 psi versus 43 psi. Am I now pushing the fuel too much? When I turn off my car my gauge does not zero. It seems to want to stop at 20 psi. I never noticed but is this normal? My oil gauge does go back to zero. I assume that since the fuel is always under pressure that sitting at 20 psi when the car is off is normal. So I went back and took the ground from the relay and connected it back to the FPC and now the pump primes like it used to and the hum goes away. So I believe this is how it is supposed to be hooked up. But because I do not have an aftermarket FPR my pressures are at 70 psi at idle and I cannot drive like that. So I went back to my old wiring for now. Once I get my rails and fpr I will go back to the wiring scheme I just had. Awesome to hear. So in English for me, my idea works lol. 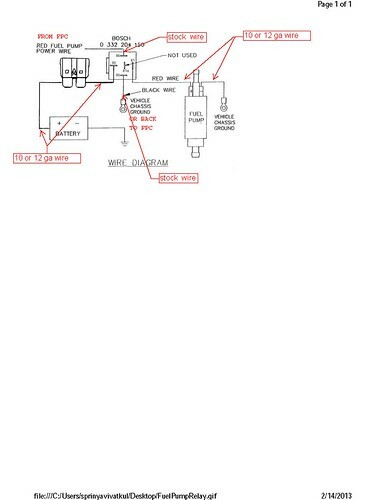 Yes, in english...If you retain the factory power to the Fuel Pump Control Module and use the factory ground from the Fuel Pump to the Controller..you will retain the pump duty cycles. Using a Relay, you can send battery power to the fuel pump to get your voltage. I split the wire running TO the Fuel Pump Controller and powered my relay as well. I struggled with this one for awhile. With help from a friend who is a x-ray technician (knows how to operate a voltage meter) we discovered that only the ground reference was changing to the pump, not the voltage. When we stuck the voltage meter on my Legacy, (in factory form), it was only getting 11.8 volts to the pump at 100% duty cycle. On certain pumps, this is just not enough voltage. Hmm, now I'm getting mixed signals. Can you throw a diagram up? I am planning on grounding the pump back to chassis. So the loop from FPC to relay and back to FPC will be intact while the amps go from battery to relay to pump to ground. It can be tuned for on the stock FPR, but it's obviously not as smooth or easy as with a more consistent fuel pressure. 100% duty cycle at idle means the return gets overrun (think boost creep on a turbo with too small / restrictive a wastegate) and pressure goes up. That's also why some people want to see voltage difference between bypassing the FPC and and just upgrading all the wire sizes, but keep the FPC in the loop. Last edited by Concillian; 02-19-2013 at 02:59 PM. So the way the OP posted is good or no? My OE fuel pump is close to being maxed and am wondering if the rewire will be a SAFE way of getting a bit more out of the pump. The car is a 2010 WRX. I know that with an aftermarket pump I wouldn't need a retune, but messing with the voltage to the pump alter anything? Whenever you mess with air or fuel you need to check the tune to be sure nothing changed. This is the most important part. My base fuel pressure jumped to 55 psi and required me to retune the entire map. I am on the stock fpr. I got a good bit of injector duty cycle headroom from wiring it though. I currently have a Walbro 255. I have 840cc injectors on the stock base pressure. Running the constant wiring as described in this thread would bump up the base pressure of the 255. I understand that. What about dropping in a DW300 pump? would it not achieve the same thing with no re-wiring since it has more flow? The idea is that I want to run E85, but don't want to run the DW1100 side feeds. By adding the larger pump I'm asking if that alone will get my IDS's down or is it the specific voltage bump in either pump that would raise the pressure to get more flow? With those injectors you are still going to want to bump the voltage to the pump. Even with the new drop in. The new pump will help, but you will still run out of fuel without upgrading the wiring to the pump. Especially on e85. Unless your HP goal is under 400 whp. Keep in mind that on the stock FPR this mod doesn't make a hill of beans difference.